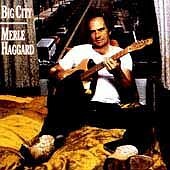 Released in 1981, BIG CITY was Merle Haggard's 47th album, including Greatest Hits compilations; it was also his Epic Records debut. An emotionally charged, crying-in-your-beer country album full of tales of heartache, pain, and troubles, Merle speaks from what seems to be experience. Honest, blue collar, and topped off with well-thought lyrics that are just as gripping as the captivating music itself, BIG CITY is one wallop of a country album sure to make you sing, cry, and think about your life. The poignant "This Song Is Mine," with lines like "Sometimes songs are done by singers that don't mean it/ And at times I've done the same and couldn't sing them/ At times I've written songs about some things I didn't do/ But these are my words/ And mine alone/ These words are true," strikes a chord with the listener and establishes the honesty and integrity that all songs are written around. Then there "love and lost" numbers like "Stop The World And Let Me Off" and "My Favorite Memory," two tender country ballads sure to remind you of your greatest love in your life. Whether the song is "Big City" or "Texas Fiddle Song," the first a Western Swing number while the second is a wild hoe-down dance you'd be foolish to pass on, or "I Always Get Lucky With You," a very silky country-lounge number, doesn't matter. What matters is the honesty that each song packs deep inside. "Call Me" and "I Won't Give Up My Train," two previously unreleased bonus tracks help give you even more music for your enjoyment. How can you go wrong with that? I'll give this album an A+.